Franklin-Monroe senior Kennedy Morris drives through the lane to score against Twin Valley South on Tuesday night. The Lady Jets won the game, 69-23. Franklin-Monroe’s Belle Cable shoots a 3-pointer from the corner against Twin Valley South on Tuesday night. She finished with 17 points as the Lady Jets won the game, 69-23. Franklin-Monroe’s Chloe Peters goes in for a layup against Twin Valley South on Tuesday night. The Lady Jets won the game, 69-23. 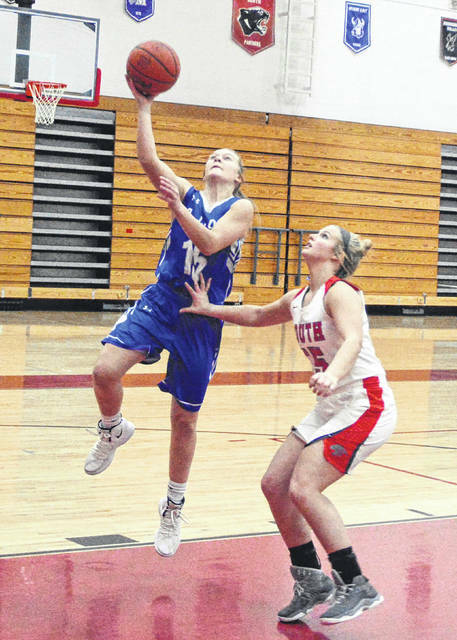 Franklin-Monroe junior Corina Conley makes a 3-point shot from the wing against Twin Valley South on Tuesday night. The Lady Jets won the game, 69-23. Franklin-Monroe’s Stella Shellabarger takes a shot from a step inside the 3-point arc against Twin Valley South on Tuesday night. The Lady Jets won the game, 69-23. 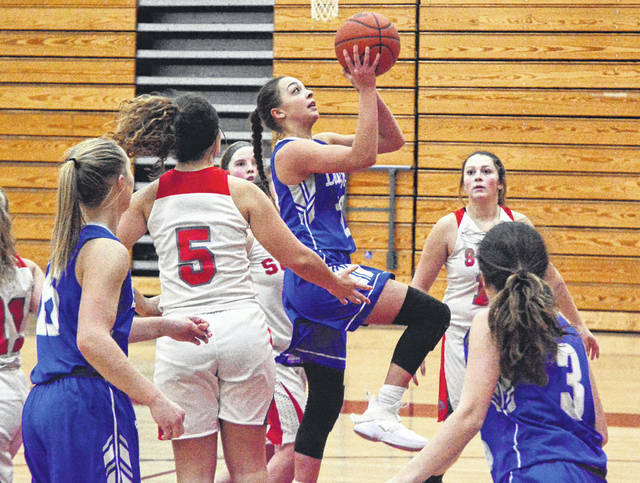 WEST ALEXANDRIA – Still smarting at their defeat the night before by the Milton-Union Bulldogs, the Franklin-Monroe Jets entered the Twin Valley South gym with grim resolve. They took care of business against the Panthers on both offense and defense. South could not find an answer as a determined Lady Jets seemingly scored at will as they returned to winning form. When the night was over it was a happy bus ride home as they returned with a 69-23 victory. The Jets used a half-court trap to get turnovers in the first quarter. They converted these turnovers into points. And when South got into a half-court offense, they had difficulty getting open shots. They only managed 2 points in the first quarter against the swarming Jets defense. On offense, the Jets shot well and scored 18. Then the Jets called off the trap in the next quarter. 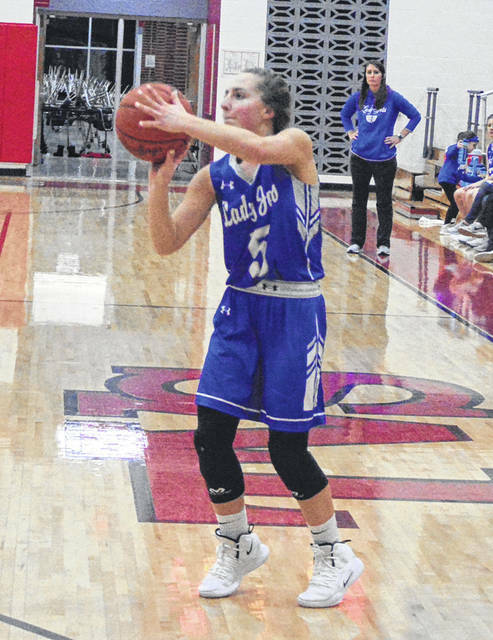 They found their range and made some string music as Corina Conley and Belle Cable scored 12 points from beyond the arc. These two players would score 19 and 17 points respectively for the game. After being held to just 25 points the night before, the team seemed bent on proving what they could do. It was a furious first half that ended with the Jets up 51-10. In the second half, the Jets were able to empty their bench and give the younger players some playing time. The players held their own against the Panthers and didn’t allow them to make up any ground. The Jets did get to work on some different looks on offense and different sets on defense. The game reversed what had happened against the Bulldogs. 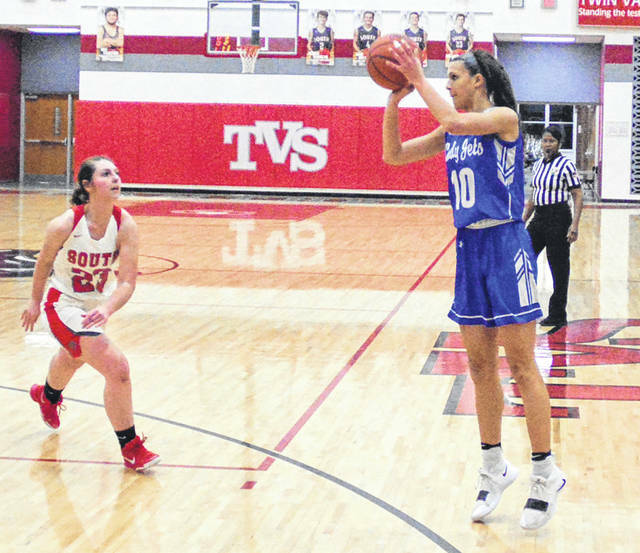 Next up for Franklin-Monroe will be their final game of the regular season at home against the Mississinawa Valley on Thursday. It will be senior night. Then they play their first round tournament game against Dayton Christian next week, so hopefully the team can springboard off of this momentum and carry it forward. 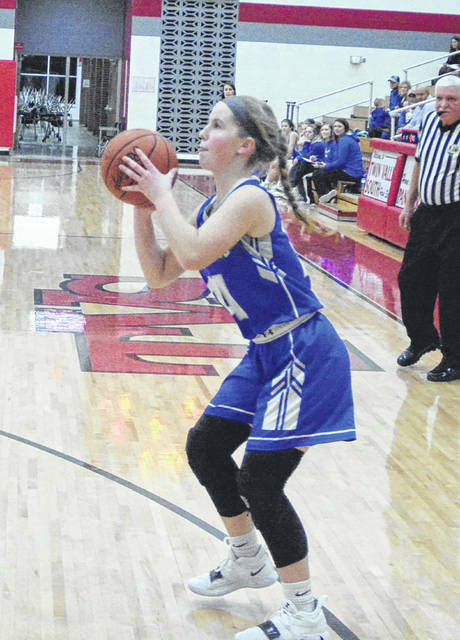 Scoring for Franklin-Monroe: Skylar Bauman 1, Belle Cable 17, Corina Conley 19, Kennedy Morris 8, Stella Shellabarger 12, Chloe Peters 12.